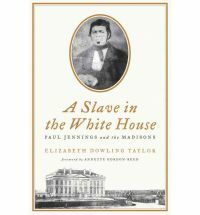 A Slave in the White House: Paul Jennings and the Madisons is a long title that is pretty misleading. Much of the story is taken up not with Paul Jennings (the slave) but with the Madisons, particularly Dolley Madison, with another good chunk devoted to Daniel Webster. I assume the historical record is scarce on details related to Paul Jennings' life, so Elizabeth Dowling Taylor, the author, had to embellish by putting in a lot of details about other people. But in that case, she should have chosen a different title. I started the book really hoping to delve deep into the Madison administration and Paul Jennings' unique viewpoint on it, particularly as the slave of "the Father of the Constitution" who fought so hard for American liberty but did not give liberty to the African-Americans he owned. But that is not what I got. Paul Jennings was born into slavery on Montpelier, the Madison plantation. As a young man, he accompanied James and Dolley Madison to the White House as a household slave. (I thought this would comprise the bulk of the book, but in reality it was only one chapter, and most of that chapter was about Dolley Madison.) After Madison left office, Jennings worked as his personal manservant for the rest of Madison's life, marrying a slave on a neighboring plantation and making life plans, expecting to be freed in the former President's will. But Madison did not free him, wanting to ensure that his beloved wife Dolley was comfortable in her widowhood. Montpelier, though, was not the thriving plantation it once was, and Dolley sold off some of her slaves. Jennings became terrified that he, too, would be sold, and approached Daniel Webster for help to buy his own freedom. Once Webster gave him the loan, he worked hard all the rest of his life to free himself and his children and earn a living for himself in Washington, DC. He also wrote a very short memoir, A Colored Man's Reminisces of James Madison, which was published in his later years and which was a primary source in this book. From the little we know about him, Paul Jennings was a very strong and ambitious man. He rose up from slavery to become a landowner himself, buying two homes in DC, and even went on to lend his old mistress, Dolley Madison, money in her times of need. He had five children, and he purchased freedom for all of those that survived childhood. He married three women and had several years with all of them (except the last, whom he married when he was past 70), but we sadly have no information on what he was like as a husband. He was courageous enough to risk his own safety soon after buying his freedom by helping a Montpelier slave escape the threat of sale. He was literate, poised and very well-mannered, and became an important member of the Washington DC African-American community. I think it's because Jennings was so interesting that I was frustrated by this book. Clearly, Taylor didn't have much information about him. I am always piqued by non-fiction books that seem very speculative in nature. Taylor, for example, begins every chapter with an italicized vignette in which she imagines Paul Jennings in different scenes throughout his life. These are all hedged with phrases like "Perhaps Jennings thought X" or "Surely Jennings wondered Y." I didn't find these at all necessary and I would much prefer that they had been edited out altogether. And there was just too much emphasis on other people in this book. In many cases, I thought this book was more about Dolley Madison, James Madison and Daniel Webster (in that order) than about Paul Jennings. There is a rich, documented history of their lives, and it can overpower that of Paul Jennings'. Overall, this book was a good introduction to a fascinating and important historical person, but I don't think the title is indicative of the contents, and I don't think there is quite enough information on Jennings to write a full-length book about him. Note: This review is based on an advanced reader's copy. I received this book for free to review. Your review echoes the others I've read, which is a lot of speculation based on very little. ...which is such a shame! I can understand why you felt misled by this one. I had not heard of this title before, but I would have been interested to read the book that you thought you were going to read -- the one you actually read, I think I'll pass on. When I read non-fiction, I don't really like the speculative embellishments. Ah so frustrating. I was all excited by the title of this book as well and would have rushed out to get it but yeah, not if it isn't actually about him, especially given how fascinating he seems to be. Too bad! That is so disappointing - and I agree about the vignettes - would almost be better to read a completely fictional but detailed account rather than a very skimpy but accurate biography. I'm ashamed to admit I have no idea who Dolly Madison and Paul Jennings are. Must brush up on my American history. They do sound like fascinating characters, though, and it's a shame we know very little about Paul Jennings. False advertising is such a drag. As is trying to make a book out of tidbits of info.